Egypt declares state of emergency following church bombings - SABC News - Breaking news, special reports, world, business, sport coverage of all South African current events. Africa's news leader. Egypt has declared a three-month state of emergency, giving the security forces further sweeping powers, following the double bombing of two churches on Palm Sunday which killed over 48 people and injured more than a 100. During a televised address to the nation, President Abdel-Fattah El Sisi says the state of emergency would be imposed nationwide following the attack on Christian Coptic churches in Tanta, in the Nile delta area north of Cairo, and in the Mediterranean city of Alexandria on Sunday, the Egyptian daily Al Ahram reported. 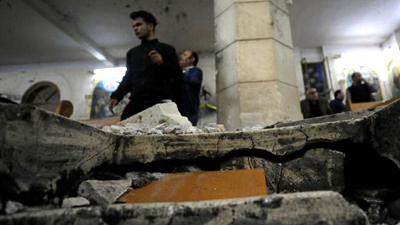 During the first attack in Tanta at least 30 people were killed. The attacker wearing a suicide belt was able to enter the church despite the presence of metal detectors at the entrance. Angry Copts have demanded answers as to how the attacker was able to get past security and why security wasn’t upgraded at Egyptian churches during an important Christian holiday when they would be filled with worshippers. Their anger follows previous large scale attacks against churches in Egypt, smaller attacks on Copts in the restive Sinai Peninsula, and increasing threats by Islamists to target Christians who comprise 10% of Egypt’s population of approximately 95 million. In the second attack in Alexandria another 18 people were killed. This attack which targeted the historic seat of the Coptic Pope, was carried out by a suicide bomber, Egypt’s Health Ministry said, adding that three police officers were also killed. Coptic Pope Tawadros II had been leading the Palm Sunday ceremony, but reportedly left the church before the blast occurred. The Islamic State (IS) has claimed responsibility for both attacks. During his televised address, Sisi also announced the establishment of the Supreme Council to Combat Terrorism and Extremism, a new body which will be given wide-ranging authority according to laws yet to be issued. The council will change laws relating to religious sectarianism in Egypt as well as legislation dealing with the growing threat of extremism. In December 2016 an attack on St Peter and St Paul’s cathedral in Cairo killed 24 people, most of them women and children. In January 2011, 21 Christians were killed as they attended a New Year’s service in an Alexandria Coptic church. IS warned in a video released in February that they would not only continue their attacks against Christians, which they regard as infidels, but increase them. Many Copts have been forced to flee the Sinai Peninsula following frequent attacks against them there. This entry was posted on 10 Apr 2017,11:45AM at 11:45 AM and is filed under Africa. You can follow any responses to this entry through the RSS 2.0 feed. You can leave a response, or trackback from your own site.